In 2010, The Taipei City Government organized numerous international competitions for various sports, such as cycling, marathon, baseball, volleyball, badminton and track & field. 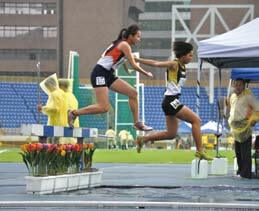 These competitions comprehensively demonstrated the balanced development and diversification of sports in Taipei. The organizing of these international events not only fulfills the function of city diplomacy; domestic athletes may also elevate competitive standards through international sports competition, while local residents may also become enthusiastically involved in the events, in turn enhancing the sports atmosphere of Taipei City. The 2010 ISU World Junior Short Track Speed Skating Championships was held at the Taipei Arena on January 8 to10; in total, 250 athletes from 29 countries and regions participated in the event, including US, UK, France, Germany, Canada, Italy, Korea, Japan, Russia, Australia, Austria, Bulgaria, Mainland China, Czechoslovakia, Hungary, India, Kazakhstan, Latvia, Netherlands, Poland, Romania, Slovakia, Switzerland, Bosnia, Turkey, Belgium, Hong Kong and Taiwan. In particular, Taiwanese competitor Lin Wei was ranked 15th overall among 46 female competitors, while Lu Ming-long was ranked 18th among 56 male competitors; both of them set new national records and outperformed numerous contestants from Europe and US. Tour de Taiwan: Taipei Leg. This is the 5th leg race of the 2010 Tour de Taiwan held in Taipei. The 2010 race was divided into seven legs and held in various counties/cities in succession, with the final leg in Taipei. 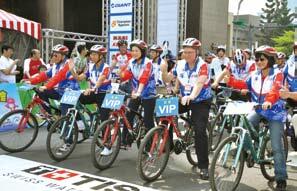 On March 14, 2010, a 60km lap-race was held on the roads surrounding Taipei City Hall; moreover, the Citizen Elite Challenge was organized prior to the Taipei leg of the Tour de Taiwan; the event was open to public participation. Several hundred competitors and more than 20 teams from America, Switzerland, Australia and Japan entered in the competition. In the end, the Action Cycling Team from Taiwan took third place while Feng Chun-kai, a member of the team, took third place as the best Asian athlete and second place as the King of the Hill. The 2010 Taipei Express Marathon was held on the road between the Wugu and Xizhi Overpass of National Highway No.1 on March 21, 2010; close to 9,000 people participated in the event, which was divided into three groups, comprised of a marathon (42.195km), half marathon (21km) and road running (10km). Numerous outstanding international competitors from the US, Germany, Japan and South Africa competed against Taiwanese competitors. The unique characteristic of the Taipei Express Marathon is that runners are able to run freely on the highway; this international competition is second only to the Taipei Marathon and enjoys wide popularity and support from domestic and overseas athletes. The sponsor has also organized educational and interesting activities, such as an interactive game area, a costume carnival and a running paradise, among others, to liven up the competition. 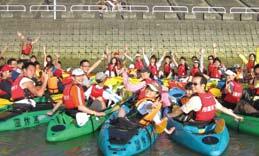 In order to promote water sports and recreation and materialize the Water Activation Policy, numerous water competitions were organized in Taipei from April to October of 2010, including the Taipei Rowing Championship, the Taipei Optimist Dinghy Regatta and International Canoe Water Polo Championship. In addition, the Summer Water Activity Educational Camp was also organized for teachers and students from elementary schools and junior high schools, while the Public Canoe Experience Activity provided an opportunity for citizens to become familiar with canoe gear, learn about basic canoe maneuvering skills and experience paddling a canoe on water. The above-mentioned activities attracted the participation of over 10,000 people. The 2010 Taipei International Athletic Meet was held at the Taipei Track & Field Stadium on May 28 and 29, 2010; renowned international athletes from 15 countries were invited to participate in the event, including South Korea, Malaysia, Singapore, Uzbekistan, Germany, Jamaica and Japan. In particular, competitors included Olympic Gold Medalists such as Tim Mack from the US, who won the pole vault event at the 2004 Athens Olympic Games, Polish competitor Tomasz Majewski, who was the shot put gold medalist at the 2008 Beijing Olympic Games, Jamaican athlete Michael Frater, who won the 4x100m relay and Valerie Vil, who received gold medal for women’s shot put, forming a formidable lineup. This was a factor 40 tournament sanctioned by the ITTF-PTTD, making Taiwan the first country in Asia to bid successfully for the right to host the event. As the host city, Taipei City jointly organized the event with the Chinese Taipei Sports Federation for the Disabled. The competition was held on July 19 to 24, 2010; in total, 149 disabled table tennis competitors from 22 countries participated in the event, with team Chinese Taipei securing 2 gold medals, 7 silver medals and 4 bronze medals. Asian City Middle-School Track and Field Invitational. In an effort to promote sports exchanges among Asian countries, elevate competitive standards and cultivate athletic talents, the event was held at the Taipei Track & Field Stadium on July 29 and 30, 2010. In total, competitors from 12 counties/cities competed together, including those from Tokyo and Nagoya, Japan, Bangkok, Thailand, Hong Kong and Macau. In the future, it is hoped to spark interest in high school sports and make this a regular competitive event. 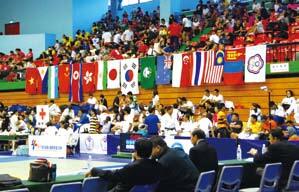 The H division preliminaries were organized by the Chinese Taipei Volleyball Association and consisted of 12 teams. The preliminaries were held in three different cities over three weeks and adopted a single round-robin system. 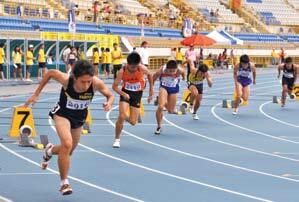 The H division preliminaries were held at the NTU Sports Center on August 20 to 22, 2010. Out of the four teams from Brazil, Poland, Puerto Rico and Taiwan, Chinese Taipei eventually defeated Puerto Rico by 3:2 to secure third place. Taipei Open International Judo Tournament audience deck. The 5th Taipei Open International Judo Tournament was held at the 1F Main Court of the Taipei Gymnasium on August 21 and 22, 2010. In total, 142 competitors from 11 countries participated in the event, with Taiwanese competitors winning 8 gold medals, 10 silver medals and 12 bronze medals. The event drew close to 1,000 spectators to view the competition. The Chinese Taipei University Sports Federation bid for the right to host the 2010 11th World University Badminton Championship, which was later sanctioned by the executive committee of the International University Sports Federation (FISU) on January 15, 2007; the event was to be hosted by Taipei City. The competition was held at the Taipei Gymnasium on September 7 to 12, 2010; in total, 200 contestants from 20 countries partook in the event. Badminton athletes from Taiwan and abroad gathered to compete against one another. Of the 6 gold medals in the competition, athletes from Taiwan demonstrated outstanding performances and defeated other competitors to win the men’s singles, doubles and mixed doubles gold medals as well as the silver medal. This was the best performance by Taiwanese competitors since 1992. 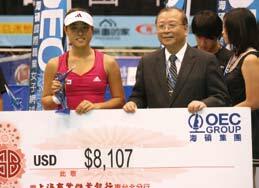 The 2010 OEC Taipei Ladies Open was held at the Taipei Arena between October 30 and November 7. Female contestants Chuang Chia-jung, Xie Shuwei and Chang Kai-chen from Taiwan competed against athletes from other countries; the women’s singles was won by Peng Shuai from Mainland China, while the women’s doubles was contested by Chuang Chia-jung and Chang Kai-chen from Taiwan, and another team composed of Taiwanese athlete Xie Shu-wei and Indian athlete Mirza. The match was comfortably won by Chuang Chiajung and Chang Kai-chen by 6:4, 6:2 to clinch the championship title. The 2010 Fubon Taipei Marathon was kicked off at 7:00 on December 19, 2010 at the front square of the Taipei City Hall. The race was divided into a full distance marathon division, half distance marathon, 9km division, 3km Fun Run division and 2km Children’s division; an estimated 110,000 contestants from 49 countries around the world participated in the event; the oldest participant was 94 years old and the youngest was only five. In the full distance marathon division (42.195km), Taiwanese athlete Wu Wen-qian and Xu Yu-fang both took eighth place ahead of elite athletes from other countries; furthermore, Taiwanese athletes Zhang Jia-zhe, Xie Qian-hao, Zhou Ting-yin and You Ya-jun also took top positions in the half distance marathon and 9km division. The domestic athletes demonstrated outstanding performances. Taipei Internationl Youth Baseball Champiconship. 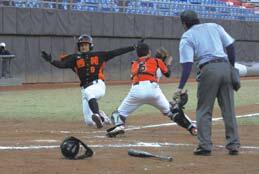 The Taipei International Youth Baseball Championship was held on December 24 to 27, 2010 at the Taipei Municipal Baseball Stadium and Xinzhuang Baseball Stadium. Teams from Taiwan included Yangming High School (Junior High School Department), Chongging Junior High School, Changan Junior High School and teams from other counties/cities; overseas teams included teams from Japan, Korea and Hong Kong, totaling 24 teams. First place was clinched by Taichung City Xiyuan Junior High School; second place was New Taipei City Erchong Junior High School; third place was Tokai, Aichi from Japan, while fourth place was Kaohsiung City Qiaotou Junior High School.